Robert Mullan, then proprietor of the "Tun Tavern", received word that he was commissioned by an act of the "Continental Congress" to seek out volunteers for the formation of the first two Battalions of Marines, which would be under the direction of Samuel Nicholas, who had been duly appointed the first Commandant of the Continental Marines by the Continental Congress. In just under 3 weeks, the two Battalions had been raised, and it was at that time, that Samuel Nicholas was officially appointed "Captain of the Marines" (the 1st Commandant). The "Continental Marines" enter the Revolutionary War. Samuel Nicholas was duly and officially promoted to Major. By the summer of 1781, the number of Officers in the Continental Marines had fallen sharply to only 3 Captains and only 3 Lieutenents on active duty. A Marine detachment is placed under the command of John Paul Jones who makes two successful raids on British soil, the first outside military force to do so in 700 years. Major Samuel Nicholas retires and returns to civilian life. With the last of the Nations warships sold, the "Continental Marines" along with the "Continental Navy", no longer needed, go out of existance. President John Adams officially signs a bill into law, creating the "United States Marines." The next Commandant was officially appointed until July 11, 1798 which under the authority of the "Act of 11", the appointment was: "Major Commandant" William W. Burrows. In late April 1800, under the "Act of 22", Burrows was duly and officially promoted to "Lieutenant Colonel Commandant", a position he assumed on May 1, 1800 and kept until March 6, 1804. The Marines’ Hymn is one of the most readily recognized songs in the world today and is the oldest of the service songs of our country. The history of the hymn has been clouded by the passing of time and confused by oral tradition. But there is no confusion on the part of the hearer when The Marines’ Hymn is heard. It is as easily identified with the Marine Corps as “The Star-Spangled Banner” is with our nation. To all Marines it has become a sacred symbol of the pride and professionalism of a Marine and you will find them standing straight and tall at the position of attention when it is performed. The music to the hymn is believed to have originated in the comic opera Geneviéve de Brabant composed by the French composer Jacques Offenbach. Originally written as a two-act opera in 1859, Offenbach revised the work, expanding it to three acts in 1867. This revised version included the song “Couplets des Deux Hommes d’Armes” and is the musical source of The Marines’ Hymn. The author of the words to the hymn is unknown. One tradition suggested that an unknown Marine wrote the words in 1847. This would have been 20 years before the music was written by Offenbach and is not likely. The first two lines of the first verse were taken from words inscribed on the Colors of the Corps. 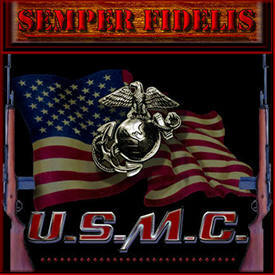 In 1929 the Commandant of the Marine Corps authorized the following verses of The Marines’ Hymn as the official version. Marine Corps Emblem "Eagle Globe and Anchor"